USC’s offensive coordinator, Kliff Kingsbury, could resign from his position with the program so that he can get a fair shot at following his NFL aspirations, according to Pro Football Talk’s Mike Florio. 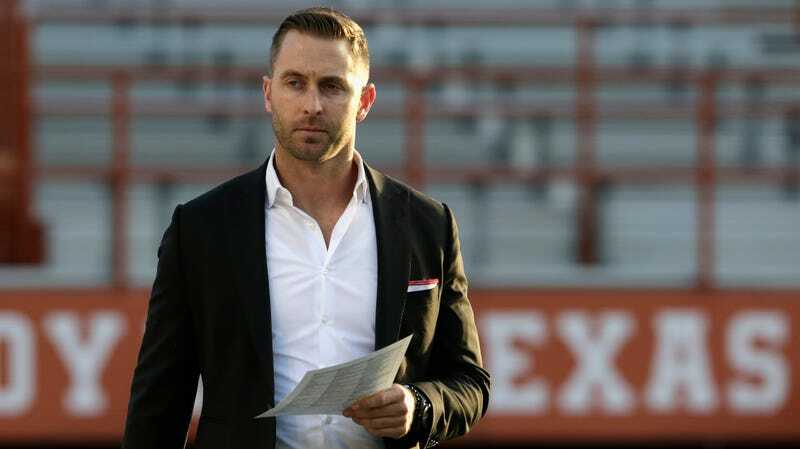 Having spent six seasons as Texas Tech’s head coach, Kingsbury is seen as an ideal prospect to fill head-coaching vacancies around the league because of his offensive prowess. The Arizona Cardinals and New York Jets have had their eye on him since firing their respective head coaches. However, it looked like Kingsbury’s chances at making the jump to the NFL were brought to a screeching halt when USC Athletic Director Lynn Swann blocked teams from interviewing Kingsbury. The block was a result of the NFL enforcing an old rule about reaching out to college coaches, according to a report from ESPN’s Adam Schefter. At last month’s NFL owners meetings in Dallas, league officials informed team executives that they now had to request permission from college athletic directors to interview college coaches. Not doing so would be considered “conduct detrimental,” and the NFL could then dock draft picks from teams, sources said. In other words, even if teams could afford Kingsbury’s reportedly-low buyout in his contract, a hire can’t happen without permission from USC. Swann probably thought he was doing the right thing by holding on to a staff member he saw as valuable in Kingsbury, but he ended up overplaying his hand. A new rule enforcement that was surely meant to protect college programs from this kind of stuff is now the reason why USC might be out an offensive coordinator. Though this situation might be the exception and not the rule, it’s still a less-than-ideal position for Swann to find himself in. I guess this is what happens when programs try to control coaches the same way they control players.